2017 continues to have the potential to be a stand-out year, in one way or another. Regardless, I’m concentrating on self-betterment, because that’s about the only thing I can control. Preparation for my own personal future seems like a good use of time, rather than worrying about incomprehensible fiction-versus-fact stuff that’s taken over our beloved planet. 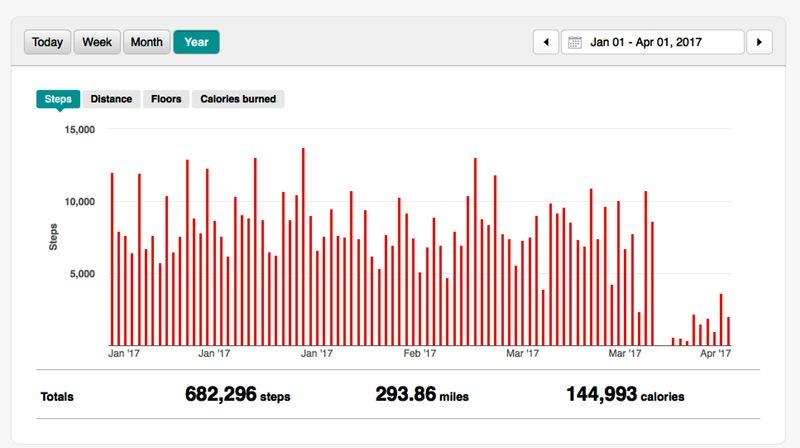 Here’s a snapshot of where I’ve been in 2017, in terms of steps, etc. You might detect from the right-hand side of the chart that I’m on hiatus from activity, and that’s because I’m recovering from some ‘elective’ but oh-so-necessary cosmetic procedures. Must wait one month before resuming vigorous work-outs. Boo-Hoo. Completely stopping my daily work-outs is causing much consternation. My days seem void and unproductive without Gym-Time. I worry about muscle loss. Will my muscles grow back just as strong as before? Or, do my atrophying muscles think I’ve abandoned them, and are becoming so disgusted and disheartened with me that I’ll never truly regain their support? I have to remember that muscles have memory and have the ability to quickly return to their previously-fit condition. Once I resume my workouts, my muscles will snap back into action. Just thinking about this does wonders for my morale. Maybe my body is really appreciating the rest-break I’m giving it. I’m giving my vulnerable body parts (with a special shout-out to my knees and lower back) the R&R they deserve after the beatings they’ve been getting from me. Sometime around around Easter or Earth Day, I’ll start easing back into exercise. My rejuvenated body should be happy to oblige when I head back to the classes I love — Zumba / Pilates / Yoga / BodySculpting / StepExercise / Barre — plus treadmill and stretching and more. Best of all will be reconnecting with my Gym pals and getting caught-up with the Locker-Room Gossip (“We’re not gossiping, we’re networking”). By firmly re-establishing my familiar routine, I know that the rest of 2017 will rock!